EUROPE: Recent project updates from the UK as the Kentish Flats Extension is officially opened, and Germany, where Van Oord and Highland Group Holdings sign a cooperation agreement. Official opening: Vattenfall has inaugurated its 49.5MW Kentish Flats Extension. Located 7 kilometres off the UK's southeast coast, it came online last year. 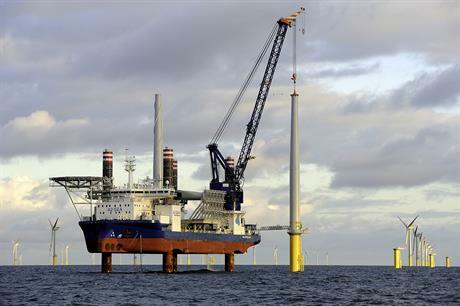 Cable deal: EDF Energy Renewables has contracted VBMS to lay the cables for the Blyth offshore demonstration project. Planned for a site off north-east England, the 41.5MW development will deploy 66kV cable technology. VBMS will install 14 kilometres of export and inter-array cables and undertake landfall pull ashore, testing, terminations and commissioning. Development agreeement: Van Oord and Highland Group Holdings have signed a cooperation agreement for the development, financing and construction of Deutsche Bucht. Both parties intend to participate in the equity deal, with financial close scheduled for the first half of 2017. The 252MW project is planned for a site in the German North Sea, approximately 90km from shore. Vessel charter: From summer 2018, A2Sea's Sea Installer vessel will be deployed at Vattenfall's Horns Rev 3 in the North Sea.